Summary: In the past, Cable arrives in New York for the first time. He disrupts the Vulture’s first robbery attempt and is injured by a bomb the villain set to cover his escape. A former SHIELD agent named Franklin Rhodes takes Cable in and offers him guidance. Meanwhile, a New Canaanite soldier named D’von Kray materializes in Canada. After Wolverine subdues him for Department H, the agency’s scientists accidentally revive D’von’s memory during their attempt to reprogram him. D’von realizes he’s from the future and that his mission is to kill Cable. 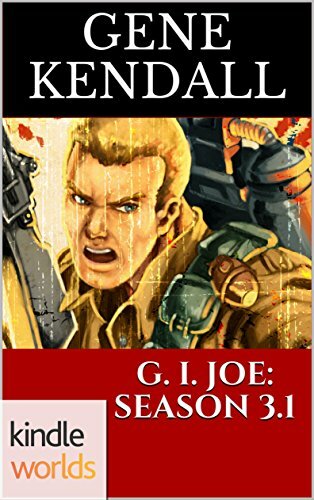 He tracks Cable to New York, and during his ambush, kills Franklin Rhodes. Wolverine arrives and helps Cable kill D’von. As Wolverine leaves, he warns Cable about his attitude. · Cable’s wife, Aliya, is already dead at this point, according to his flashback. · The Vulture tells Cable that this is his “first endeavor as a master thief.” The implication is that the Vulture had at least some experience as a criminal before meeting Spider-Man for the first time, which seems compatible with his first appearance in Amazing Spider-Man #2. · According to the opening narrative captions, this story begins two days after Cable arrived from Scotland. Presumably, this is taking place a few days after the events of Cable #-1. He’s still searching for Professor Xavier, which was his motive in that issue. 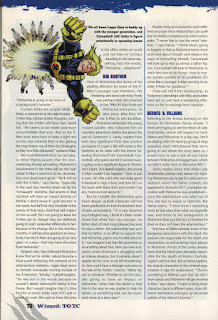 · If the story is set right after Cable #-1, which as a “Flashback” story had to be set before Fantastic Four #1, having Wolverine as a costumed Canadian agent is questionable. Alpha Flight #2 established that Mac Hudson was inspired to create Canadian heroes after seeing the Fantastic Four on television for the first time. Plus, even though Wolverine’s first appearance in Incredible Hulk #181 doesn’t explicitly establish this is his first mission as a costumed hero, Chris Claremont did have Wolverine say as much during a flashback in Uncanny X-Men. Aaaaand, wasn’t one of those Logan one-shots, which still featured Wolverine as a plainclothes secret agent, already set circa Fantastic Four #1? · Franklin Rhodes arranges for Cable to get a haircut, which marks the end of Cable’s adventures with the flowing white hair. 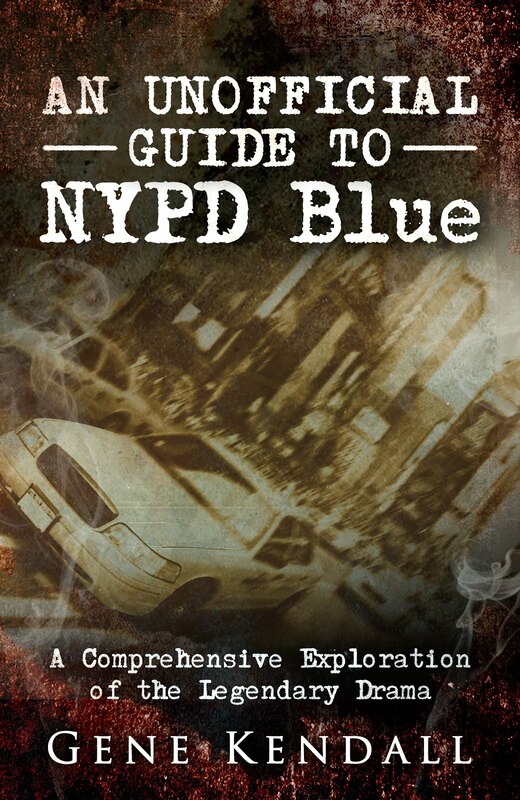 Production Note: This is a forty-eight page, prestige format book, priced at $5.99. Unfortunately, this is a six-dollar one-shot that was allegedly going to reveal Cable and Wolverine’s secret past, a mystery that was almost ten years old at the time. What the audience gets is a brief team-up by the characters that doesn’t answer any of the old questions (They don’t even fight! 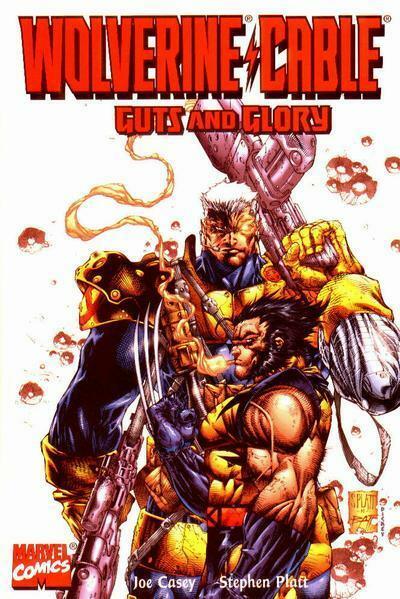 Cable and Wolverine are supposed to be old sparring partners. ), art that’s slapped together by an army of inkers, and a story with no message deeper than “war is bad.” It’s hard to feel as if you got your money’s worth. Summary: After the green energy living inside Gambit saves him during an accident in the Danger Room, Professor Xavier demands that he reveal the truth. He relents to an examination, which leads to the green energy violently making her presence known. While the X-Men recover from her attack, Gambit awakens in Manhattan, Indiana. He investigates the flashes of memory placed in his mind and realizes that the green energy succubus is a mutant named Mary Purcell. She was believed dead after her mutant powers manifested at a gas station, and years later encountered Gambit while he was stranded at Magneto’s Antarctic base. After following the trail left from Antarctica, the X-Men find Gambit and use Beast’s invention to detach Mary. Gambit tries to free Mary from the device, but his powers dissipate her from all known existence. Later, at Mary’s grave, Rogue and Gambit make peace. · Xavier remarks that Gambit’s bio-kinetic energy has always made it difficult to mind-link to him, and even more difficult to read his mind. · While watching surveillance footage in Antarctica, the X-Men discover that Magneto was impersonating Erik the Red during Gambit’s “trial” in Uncanny X-Men #350. The only explanation for why Magneto would don the disguise is that he wanted to “distract” the X-Men. I Love the '90s: Gambit is watching a Buffy marathon on his VCR when Professor Xavier confronts him about hiding secrets from the team. Production Note: Someone forgot to paste in images of the X-Men on Xavier’s videoscreens as he monitors their mission in Antarctica. Instead, we merely see the words “Beast,” “Marrow,” and “Rogue,” written by the artist, on the screens. 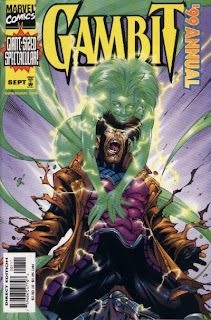 Review: Fabian Nicieza was stuck with the “Green Mist Lady” mystery when assigned the Gambit series, and I’m not sure if he was ever thrilled about it. I don’t recall any readers being too excited over the concept either, considering that it was introduced at the very end of Steven Seagal and Joe Kelly’s stint, an era dominated by editorially mandated “exciting new directions” and numerous dropped storylines. Nicieza puts an honest effort into it, though, and he manages to address the horrific ending of Uncanny X-Men #350 in the process (another mess he wasn’t responsible for). Forcing the X-Men to travel to Antarctica and face their abandonment of Gambit is something that should’ve already happened in the main books by this point, but evading the issue for so long works to this story’s advantage. Nicieza plays the angle that the X-Men have avoided thinking about their actions because they’re so ashamed of them, making their discovery of Gambit’s audio diary (kept on an old tape recorder he found) even more demoralizing, as they’re forced to listen to his first-hand account of stripping plastic off of wiring and seat covers for food. Nicieza’s choice of a team is also smart, as he pairs two X-Men who were there (Rogue and Beast) with one who wasn’t (Marrow). As Marrow points out, what did Gambit do that was so bad that he was sentenced to starve and freeze to death…by the same people willing to take her in? The story also makes it clear that the X-Men are deliberately keeping Gambit’s role in the Morlock Massacre a secret from Marrow, a continuity point that really should’ve been addressed in the main titles as soon as Gambit was brought back. The origin of the Green Mist Lady presents more of a problem, though. Nicieza wants to ground her in reality by giving her a suburban origin and typically dysfunctional home life, which is fine, but it’s hard to reconcile that with the early appearances of “Mary.” We learn that Magneto discovered Mary when she tried to bond with his body, but the reader never discovers how exactly she ended up in Antarctica. (And why she would want to go there.) Nor do we learn how she teleported Gambit from New York to Indiana instantaneously, unless the idea is that she can turn Gambit’s body into mist form. We also have to assume that her mist form moves extremely fast for this to work. And Mary’s motive, that she wants to create a new life form with Gambit so that the world will finally discover she exists, is just batty. I guess this is an attempt to reconcile her dialogue from her early appearances in X-Men, but the concept is just nonsensical. Still, the ending isn’t all bad. Making Gambit indirectly responsible for her death plays into his ongoing guilt complex, as he’s left to mourn another person he’s used and accidentally hurt. Not that he’s too broken up about it, of course; I don’t think we hear about Mary the Mist Lady ever again. That cover has no real relevance to this issue, but I’m glad the editors were willing to let Andrew Robinson just go nuts during his short stint as cover artist. It’s certainly more interesting than anything that happens in the story. X-Man’s Alaska trip continues, as he “bonds” with Cyclops in a clumsily written fishing scene. Trying to incorporate Cyclops and Phoenix into the book sounds fine in theory, but in practice it just emphasizes how vacant their relationship is. A few years earlier, Cable’s issues with Cyclops and Phoenix created a few memorable emotional scenes, while no one has ever seemed to care that much about X-Man’s relationship with his genetic parents. And every time we see Phoenix, it’s just a reminder that X-Man has the hots for her clone, which is something we all need to forget. Oh, joy. It’s a “hero wakes up in fantasy world of his own making” storyline, this one set in the idyllic small town of Greyville. As tired as this premise is, I will say that Mike Miller’s art livens things up a bit. He apparently didn’t draw these issues as last minute fill-ins, which is normally how the X-office employed him, so we’re seeing a better representation of his skills. 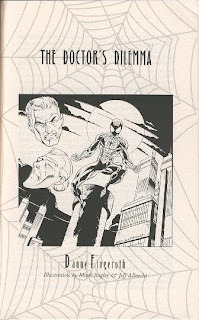 His renditions of Spider-Man and this arc’s “mystery foe” rival anything going on in the Spider-titles at the time. 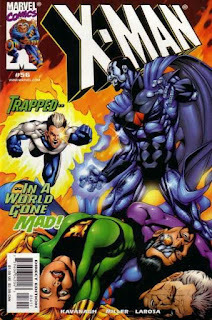 Since X-Man doesn’t have much in the way of friends or a supporting cast, Kavanagh is forced to use Spider-Man, Threnody, Madelyne Pryor, Cable, and the AoA version of Forge to populate this “perfect world.” Hey, wasn’t that the title of an Amazing Spider-Man storyline from earlier in 1999? One that had Mysterio using his illusions on Spider-Man’s friends in an attempt to learn his secret ID? Hmm…anyway, the only segment of the story that doesn’t come across as filler is a brief scene that has a pregnant Threnody following X-Man’s trail. And Threnody, for some reason, now commands an army of zombies that rise from the sea, chanting her name. Yes, that makes perfect X-Man sense. 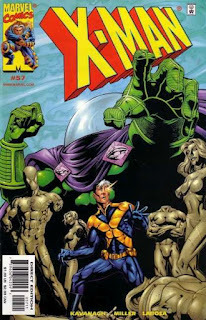 X-Man targets the Purple Man as the creator of the Greytown illusion, but soon learns that this is another fantasy. Eventually, Mysterio makes his presence known, revealing that he spotted X-Man at a carnival a few days earlier and has been using his illusion powers ever since to manipulate X-Man into committing crimes (and search his fantasies for Spider-Man’s secret ID, which he still refuses to reveal). 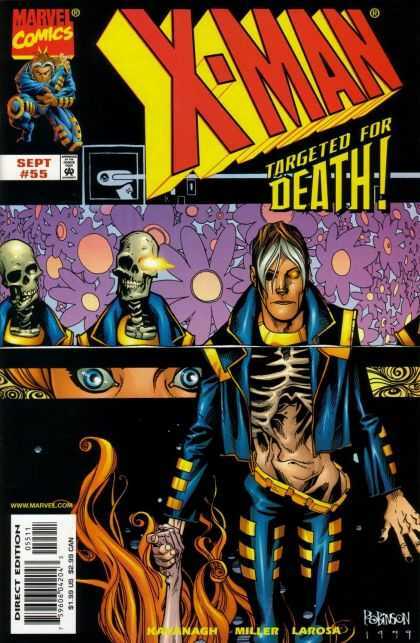 Since X-Man is one of the few telepaths who hasn’t regained his or her telepathy following “Psi-War,” Kavanagh’s actually using the current continuity to his advantage, because it’s highly implausible that the strongest telepath on Earth could’ve been duped by Mysterio under normal circumstances. And in case anyone cares, Mysterio is exhibiting new mind-control and hypnosis powers that he claims have been lost to mankind for over a millennium. I’m assuming this was thrown in to justify how Mysterio survived his suicide in Daredevil a few months before appearing in Amazing Spider-Man, which had him dismissing his suicide as a prank. Don’t worry about it, guys. The Spider-office has a nonsensical miniseries in the works that will bravely answer none of those questions. The story ends with X-Man trapping Mysterio in his own illusion, a signal that his telepathy has conveniently returned. The exertion knocks him out, however, leaving him prey to Threnody and her army of the walking dead. Considering this title’s track record, though, I wouldn’t be surprised if the next issue opened with X-Man leading the Avengers on an attack against the Badoon, or aiding Speedball in his deadly battle against Count Plaqula. This is not the greatest Wizard special devoted to Wolverine, no. This is just a tribute. 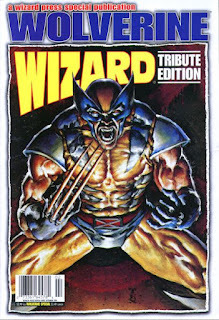 Tribute to Wolverine is one of the better Wizard specials, with numerous interviews and a comprehensive history of the character, which couldn't have been easy to assemble, even back in 1996. This is an interview with Larry Hama and Bob Harras to promote Wolverine’s brave new direction as Scooby Doo. If you ever wondered what on earth they were thinking, this is what on earth they were thinking. Summary: A vision sends Wolverine to Prescott, a nearby town with a controversial nuclear plant. He meets Red Waterfall, an Indian who refuses to sell land near the plant; land the plant needs to comply with federal regulations. Meanwhile, a teen named Jimmy starts a group called the Devos, youths determined to fight the technological age. Their rituals attract an ancient spirit, one that calls for a female sacrifice. Boom Boom is kidnapped and brought to the plant to be sacrificed. A young follower brings Jimmy the Spear of Destiny, recently stolen from Germany, which he plans to use on Boom Boom. Wolverine and Red Waterfall rescue her and confiscate the Spear. When the ancient spirit emerges, Wolverine uses the Spear to drive it away. The town returns to normal, and the plant is soon closed. 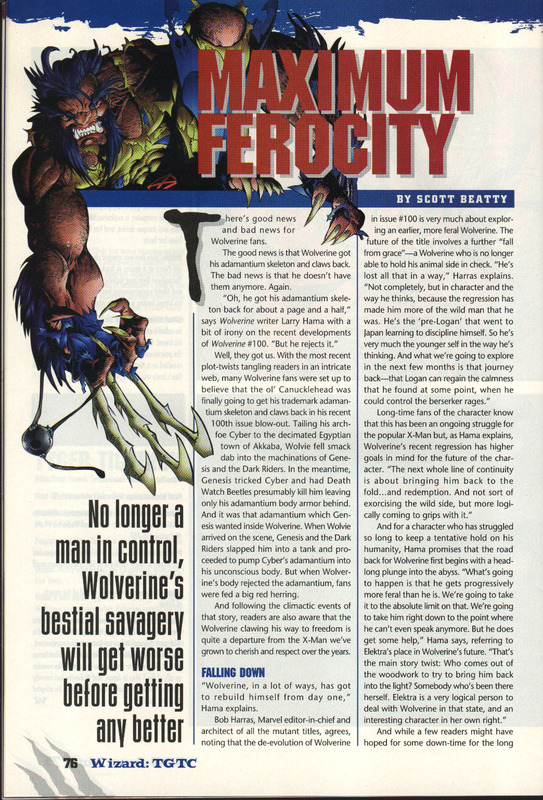 This story is set before Wolverine lost his adamantium skeleton in X-Men #25. The idea that Boom Boom regularly visits a small town north of Salem Center creates a few continuity problems. As a member of X-Force, she wasn’t living in Salem Center until X-Force moved in with the X-Men, which was after Wolverine lost his adamantium. It’s possible the story is set during the early days of X-Force, when the team lived in the Adirondack Mountains; however, X-Force were known fugitives at the time, which is hard to reconcile with Boom Boom casually walking through town and hanging out with teenagers. Production Notes: This is a forty-eight page prestige format one-shot. The price is $5.95. Creative Differences: Numerous lettering corrections in this one. Some are obviously done to add exposition, but others have no apparent significance. Approved By The Comics Code Authority: Even though the prestige format books weren’t submitted for Code approval, Marvel’s reluctance to show blood probably explains why the chickens sacrificed by the Devos leave green blood behind. I Love the '90s: Red Waterfall predicted trouble “in the 1990s, the anniversary years.” Also, the owner of the nuclear plant says the jobs it creates will help during the recession, although the early ‘90s recession was long over by 1994. · First of all, I’m half-convinced that Boom Boom was originally intended to be Jubilee. She’s repeatedly referred to as a “girl who wishes she were a boy,” which doesn’t fit Boom Boom, but does match Jubilee’s original appearances (remember when she was a tomboy?). Her powers are also described as firecrackers, which is the standard definition of Jubilee’s powers. 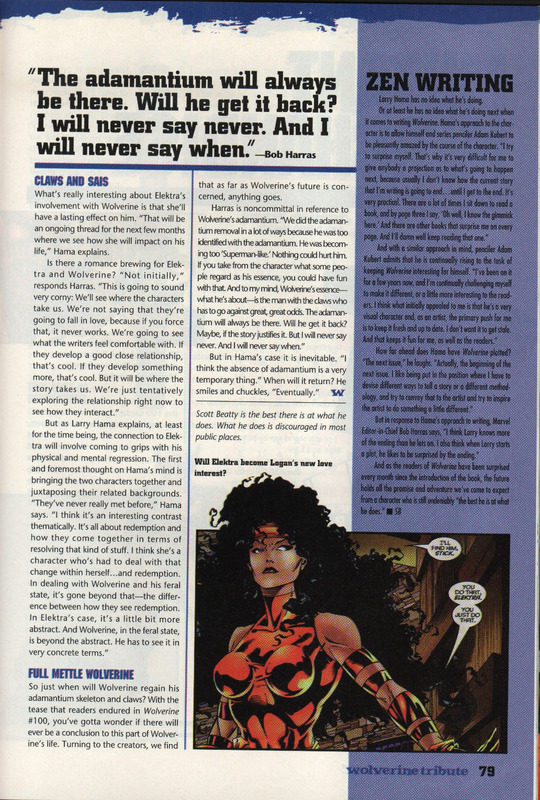 · Even if the female lead was always supposed to be Boom Boom, just using that version of her name dates the story. She’s been “Boomer” since the early days of X-Force. This couldn’t be fixed? · The leader of the Devos, Jimmy, is revealed as the son of the nuclear plant owner about halfway through the story. There’s an obvious conflict between the two, but it doesn’t amount to much of anything. The only real confrontation between them is so rushed you have to wonder why it was even included; the story (as published) could work just as well without Jimmy’s father at all. · By the way, aren’t nuclear plants public utilities? Could a lone individual even own one? · The scenes of a ten-year-old boy casually stealing the Spear of Destiny from a museum are just mind-boggling. · The theme of the story involves technology outlasting the men who create it, which has Nocenti connecting Wolverine’s metal skeleton with the ecological consequences of nuclear power. Just when you think she’s going for a blanket rejection of technology, though, she has Red Waterfall give Wolverine a speech about the futility of fighting destiny, and even has him speculate that it was inevitable that the white men would defeat the natives. Therefore, white men now control technology, even if it will poison the earth. It’s all a part of a great test, and perhaps nothing should be done about it. That’s certainly a strange turn for the story take; even stranger is the conclusion, which has the nuclear plant inexplicably shut down, and Red Waterfall happily planting herbs in his garden. So what was the point of his speech? Was there a dramatic reversal that got left on the cutting room floor? Like the rest of the story, I’m left wondering what on earth happened to this book. Summary: A dark elf plagues Cerise’s dreams. With Excalibur, she traces the source of her dreams to a nearby castle, occupied by an elderly magician named Ghath. He blames the dreams on his attempts to return to his true world and apologizes. Suddenly, the dark elf Khaos breaks in and attacks. After taking him captive, Cerise realizes that Ghath is the true enemy; a sorcerer who’s still causing destruction on his homeworld of Irth. Excalibur and Khaos follow her to Ghath’s castle, where they’re magically transported to Irth. They defeat Ghath, only to discover after returning home that remnants of Ghath’s spell have trapped Khaos on Earth. He declines Excalibur’s offer to join and focuses on discovering a way home. 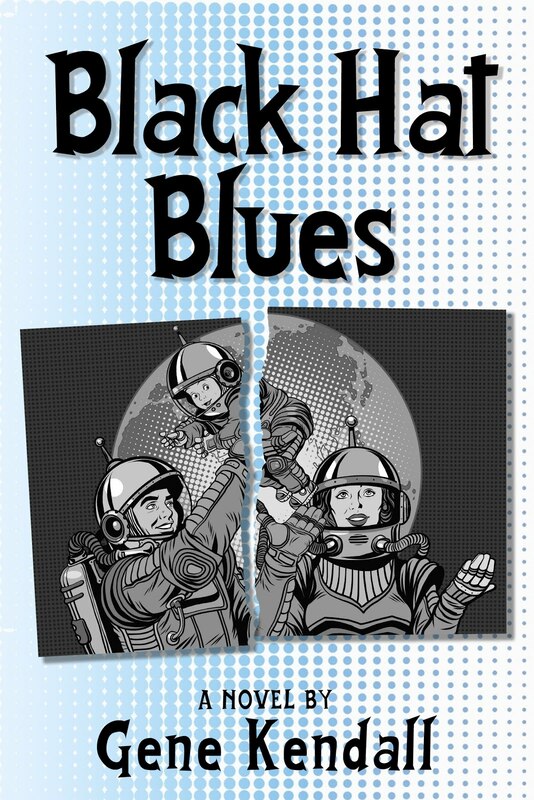 Gimmicks: This comic comes polybagged with a Khaos trading card. Review: Excalibur had a 1993 annual? A Collectible First Appearance of a New Marvel Superstar annual?! Somehow, I was unaware of this gem until I discovered an online article about the 1993 annual stunt. This same article has an interview with Evan Skolnick that confirms that Khaos and his associated cast of characters began life as creations in Skolnick’s teenage Dungeons and Dragons campaigns. 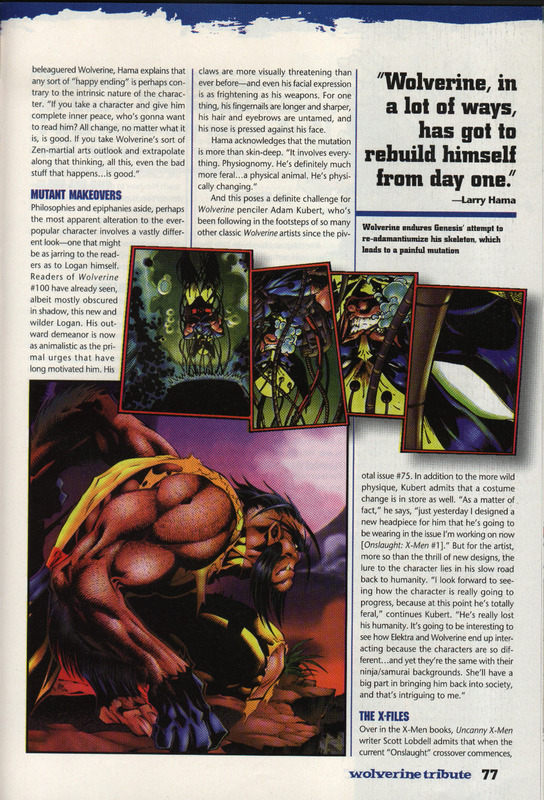 This means that Khaos has ten times the backstory of the average 1993 annual creation, which Skolnick attentively spells out over a lengthy flashback sequence. Trust me, there’s a lot of history behind Khaos that I haven’t recapped, largely because it isn’t germane to the main story at all. 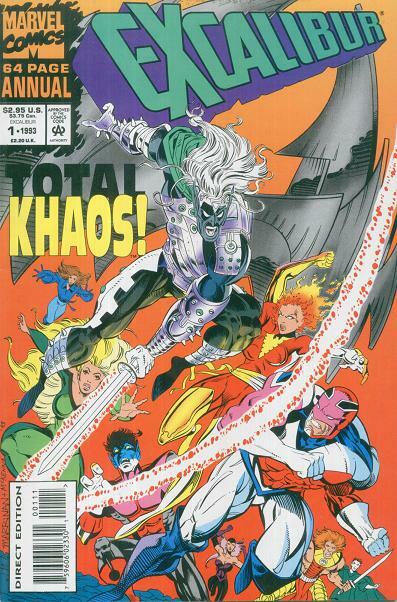 Now, of course it’s absurd that Excalibur’s caught up in an adventure with a Marvel staffer’s D&D avatar, but I have to admit that Khaos is more tolerable than almost all of the other 1993 debut characters. There’s nothing unique about a noble warrior from a fantasy world that’s trapped on Earth, but I don’t recall those tropes showing up too often in the early ‘90s. Khaos is about ten years behind the times, but considering that those times mostly brought us cyborg bounty hunters with fantastic mullets, he’s almost a welcome bit of nostalgia at this point. The problem with the story is the lack of connection between Khaos and Excalibur. There’s some talk of Khaos being a misfit during his youth, and Nightcrawler is jealous of Cerise’s apparent attraction to him, but these are minor moments in a very dense story. There’s also a tacked-on rationalization that Khaos and his friends could be Irth’s incarnation of Excalibur, which is a weak way of trying to tie Excalibur’s long-running alternate reality shtick into throwaway annual filler. This could just have easily been a West Coast Avengers adventure; trying to sell the audience on some phony association with Excalibur is just a reminder of how generic this story has actually been. Summary: A knight serving the Princess Flavia holds Numbers hostage, forcing the Technet to retrieve special nectar from another dimension. After narrowly escaping from giant bees, Technet returns with the bounty. Flavia appears and takes the nectar, using it to cure the knight’s acne. Review: It’s a Technet comedy story, so of course this is going to be silly and lighthearted. The use of Princess Flavia is a nod to people who might be familiar with the character from literature or opera, but it’s not as if Cavalieri is trying to produce a serious work here. It’s a joke story, and since most of the jokes work, I can’t complain. 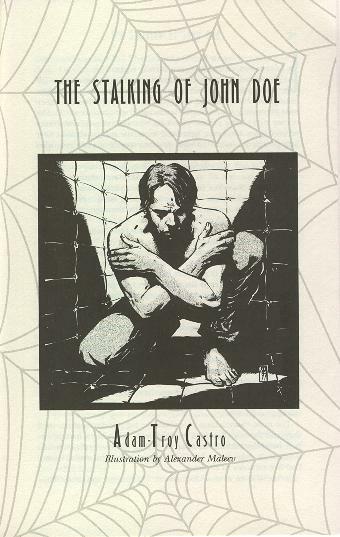 The Plot: Peter Parker is admitted as John Doe to the psychiatric ward, hallucinating violently after being poisoned by Kraven the Hunter. Delirious, Peter latches on to Dr. Gwendolyn Harris, whose name and face remind him of Gwen. When Kraven enters the hospital, Dr. Harris trusts Peter enough to accept his request for gauzes to cover his face. He confronts Kraven, and when Kraven threatens Dr. Harris (after she futilely tries to sedate him), Peter finds the inner strength to break out of Kraven’s grip and take the fight outside. Weeks later, Dr. Harris receives an anonymous note thanking her for her help. Web of Continuity: Like the previous story, this nominally takes place in “recent” Spider-Man continuity. The presence of Kraven the Hunter creates a problem, though, since he was killed off in 1987. Is this one of Kraven’s sons? Perhaps, although nothing in the story indicates this. Spider-Man even mentions Kraven’s relationship with the Chameleon (implying this is the original), although he is delirious at this time. Could one of his sons fit into the mid-‘90s continuity of this story? Alyosha Kravinoff only fought Spider-Man once before declaring him an ally in Spectacular Spider-Man #253, which would leave Kraven’s oldest son, the Grim Hunter. And Grim Hunter was only active for a few months before getting killed, so that leaves a very tiny window for this story to take place in. Review: The final, and longest, story in the book, “The Stalking of John Doe” has a solid hook, but a few nagging plot problems. The major one is the idea that Dr. Harris can’t recognize Spider-Man without his shirt and mask. As the story puts it, he’s only wearing blue tights and a straightjacket. Okay, but…what happened to his boots? They easily identify him as Spider-Man. (And where does that belt go when Peter takes his shirt off, anyway?) And, while it’s not hard to imagine Peter ripping off his mask and/or his shirt while in a psychotic rage, I have a hard time picturing him going through the effort required to take off his long, tight gloves or webshooters. Plus, there’s the continuity nerd question of when this story is supposed to be taking place. Spider-Man mentions that he was ambushed by Kraven in SoHo, which could imply the story is set in the early years of the marriage, circa Amazing Spider-Man #325. However, Kraven was dead long before they moved. Okay, then…being ambushed in SoHo doesn’t mean he’s actually living there, but the placement of this story still creates problems. Since the previous story had Alistair Smythe in his cyborg-monster ‘90s phase, it has to take place after 1987’s “Kraven’s Last Hunt,” which means the reader has to create his or her own explanation for what Kraven’s doing here (or which Kraven this is). Judged on its own merits, the story still has a lot going for it. It’s a great setting for a Spider-Man story, and the shock opening of a crazed Peter Parker fighting his way out of a straightjacket certainly grabs your attention. And, even though this is probably the fifth story in the book to make Peter’s guilt over Gwen’s death a major plot point, Castro puts the doctor’s coincidental resemblance to Gwen to good use during the final fight scene. His characterization of the staff of the hospital and the beleaguered police officers tasked with bringing Peter in also adds a lot of personality to the story. Having finished the book, I now wonder if this story wasn’t intended to be the final installment, but was moved to the end to make a stronger finish. After all, “My Enemy, My Savior” would’ve been an extremely weak closer. Perhaps someone pushed this story to the back, not considering the continuity issues that the move created. The Plot: Biographer Randall Andros decides to write his next book on Dr. Octopus, focusing on his past as respected scientist Otto Octavius. After interviewing former colleagues and Daily Bugle staff members, Randall is unable to attain a firm idea of who Octavius is. Unexpectedly, Octavius gives Randall an opportunity for an interview. He ends the interview after a few questions, and when Randall returns home that evening, he’s shot by one of Octavius’ henchmen. Spider-Man arrives, hoping to warn Randall away from Octavius, in time to save him. 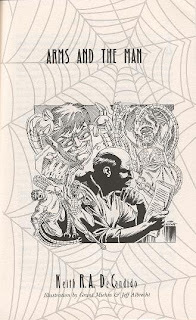 Web of Continuity: This story is set immediately after Amazing Spider-Man annual #15.
Review: Told from the point-of-view of Dr. Octopus’ unwise biographer, this is an extensive character piece on the villain that attempts to reveal who exactly Dr. Octopus was before his accident. There is actually some controversy amongst fans on this subject, mainly because different writers have different interpretations on who Otto Octavius was before radiation infected his brain. 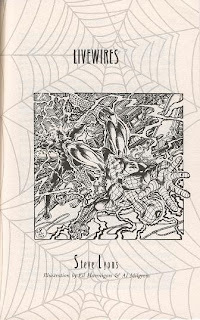 DeCandido makes those contradictions a story point, as Randall interviews any living person he can find with a connection to Octavius and finds that no two people have the same opinion of him. Was he merely arrogant, or truly megalomaniacal? Did Octavius have compassion for other humans, or did he always view them as annoyances? Most importantly, is he crazy or genuinely evil? There’s a lot of great character work in this piece, and it’s heartening to know that DeCandido looked into one of the few previous attempts to flesh out Dr. Octopus, Spider-Man Unlimited #3, and used that story to his advantage. Of course, once modern Marvel took a look back on Octavius’ past (conveniently at the time of Spider-Man 2’s release), all of this work was bulldozed. 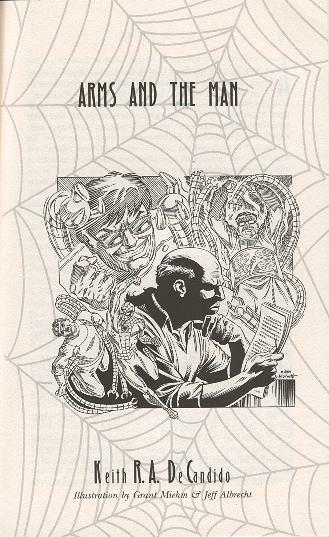 The Plot: Jonah Jameson, recipient of the Humanitarian of the Year honor, is kidnapped by Alistair Smythe and the Scorpion. Strapping Jameson inside a Spider-Slayer, they send him to the Daily Bugle building to wreck havoc until the robot self-destructs. Spider-Man arrives, fights off Scorpion, and rescues Jameson. Later, Smythe berates Scorpion for blowing their scheme. Their fight is interrupted by Spider-Man, who followed the tracer he left on Scorpion. That night, Jameson attends his award ceremony and refuses the honor, citing his role in creating Scorpion and the Spider-Slayers. However, he pledges to continue his crusade against costumed menaces like Spider-Man. 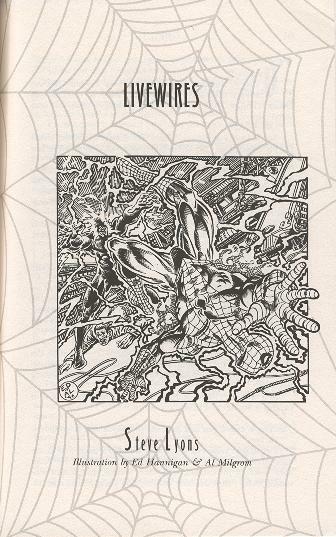 Web of Continuity: This story is set in “recent Spider-Man continuity” according to the Continuity Guide. 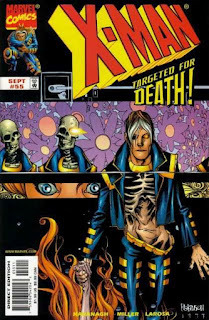 “Recent” would be 1997, although Kate Cushing appears in the story as a Bugle editor, and she was written out of the books a year earlier during the final days of the clone saga. Unless we’re to believe this story took place during the Pursuit/Shrieking/Scarlet Spider days, it would have to be set some time around Amazing Spider-Man #375.
Review: I wonder why the “Untold Tales” in this book skip all the way from 1980 to 1997? That skips over the Roger Stern Amazing era, the debut of the alien costume, the Black Cat days, and the early marriage years. And after a seventeen-year break in continuity, this is what we get -- a generic Jameson vs. Villains He’s Created story? Jameson works when he’s over-the-top absurd, or unexpectedly poignant on those rare occasions. He’s neither here; even having him refuse his Humanitarian of the Year award because of his past mistakes is muted by the story’s admission that Jameson had already faced the legal consequences of funding Scorpion and the Slayers years earlier. It’s hard to discern what the point of the story is supposed to be, and it’s not as if we haven’t seen this basic premise numerous times before. 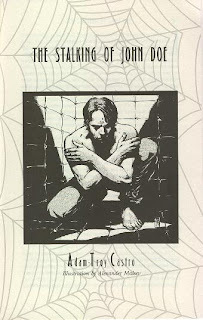 The Plot: Peter learns from Harry Osborn that their classmate Marty Shultz has committed suicide. Peter immediately flashes back to weeks earlier, when Marty reached out to him, only to be stood up when Peter had to go into action as Spider-Man. Still uncomfortable with his guilt, Peter skips the funeral and goes on a Daily Bugle assignment to find the Shocker. After a brief altercation, Spider-Man follows the Shocker to a cemetery. He soon realizes that the Shocker is Marty’s brother. He allows Shocker to visit Marty’s grave before taking him back to prison. The Subplots: Peter has recently proposed to Mary Jane and is waiting for her answer at the beginning of the story. In the closing paragraphs, the story shifts ahead a few weeks after she turns him down. Spider-Man travels to the Brooklyn Bridge and reflects on moving forward with life. 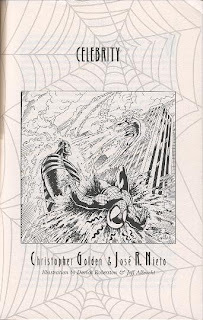 Web of Continuity: The Continuity Guide lists this story as taking place “around the events of Amazing Spider-Man #183-184.” Aside from giving the Shocker a younger brother, the story also reveals that his parents died when they were young, leaving Marty alone as Shocker pursued a life of crime. Review: “Poison in the Soul” is one of the book’s best stories, with a spot-on characterization of Peter Parker and very real emotional sequences that take advantage of the subject matter without crossing the line into mawkishness. Greenberg’s also chosen an interesting era for a story that confronts Peter with young adult suicide. The most obvious choice for a story following Peter’s failed proposal to MJ would be some form of romance, while Greenberg’s focusing instead on a larger issue. Peter is graduating college and entering true adulthood. His love for MJ has given him the courage to move on after Gwen’s death, and now he feels confident enough in their relationship to reveal his secret identity and begin a life together. Marty, for the reasons the story never makes clear (understandably, since he was only an acquaintance of Peter’s) can only see more pain and bitterness in his future. The Shocker is squandering his by refusing to give up crime. Spider-Man gives him an inspirational speech (which is nicely written, even if we know that Shocker won’t listen to a word of it) at the end and makes his own peace with Marty’s death. There are two flaws that are hard for me to ignore, though. I always hate the massive coincidences that connect Peter Parker’s personal life to one of his villains somehow. This isn’t that bad of an example, since it’s the Shocker’s brother and not the Shocker himself that Peter went to college with, but still…Peter Parker’s freshman lab partner just so happened to be the Shocker’s brother? My other complaint is one that Greenberg himself mentioned in the “Life of Reilly” serial -- the Brooklyn Bridge. Again. There aren’t any supervillain fights this time, thankfully, and the story itself is about moving on so it’s a fitting place for Spider-Man to say goodbye…but can we please never see this bridge again? The Plot: ESU student Marcy Kane is allowed to conduct experiments on Electro, confident that his powers can be contained by an electrical circuit. Practical joker Steve Hopkins is removed from the project by Marcy, but not before he insults and mocks the captive Electro. Later, one of Steve’s pranks causes a brief power outage, allowing Electro his opportunity to escape. He takes Steve hostage and is soon confronted by Spider-Man. When Electro has Spider-Man pinned, Steve knocks him out with a plastic skeleton he was saving for a future prank. The Subplots: Peter Parker is forced to call off his date with Deb Whitman in order to keep an eye on the Electro experiment. His lie that he needed to cover the story for the Daily Globe is blown that night when a Globe reporter and photographer arrive. Web of Continuity: This story takes place shortly after Peter Parker, the Spectacular Spider-Man #45.
Review: I guess someone had to step up and represent the long-forgotten days of Marcy Kane, Steve Hopkins, and Deb Whitman. Unfortunately, the story is even less memorable than the era that created this supporting cast. With no real emotional hook for the story, the most interesting event is obnoxious prankster Steve Hopkins coming face-to-face with Electro just a few hours after he viciously insulted him. That is funny, and there’s a cute meta-joke about Spider-Man and clones (one of the few decent ones I’ve ever read), but that’s really it. I just discovered that Roger Stern wrote many Spectacular Spider-Man comics from this era; I imagine he would've been a better choice to represent this chapter in Spider-Man's history. The Plot: Inspired by the death of Gwen Stacy, the Rooftop Ripper targets young blonde women and leaves their bodies on rooftops. During their first encounter, Spider-Man learns that the killer has super-strength. The Ripper knocks him unconscious and leaves him next to another victim. The next day, Spider-Man ponders using lethal force against the Ripper. He’s certain of the idea, until he mistakes a teenage purse-snatcher for the Ripper and accidentally breaks his arm. With a stronger resolve to protect human life, Spider-Man locates Ripper’s next hostage, saves her, and defeats Ripper by staying calm and focusing on the battle. Web of Continuity: The Continuity Guide specifically sets this story three weeks after Amazing Spider-Man #122.
Review: One of the weaker installments in the book, largely because the Rooftop Ripper is such a lame villain. No motivation outside of general evilness, unexplained super-strength, dull visual (ski mask and jacket…not that an exciting visual would’ve properly translated in a prose story anyway), and dialogue on the level of a made-for-Lifetime villain all add up to a huge dud. And even though Richard Lee Byers does come up with a plausible rationalization for Peter to at least briefly contemplate lethal force, the concept still seems out of place in a Spider-Man story. Finally, attaching a serial killer to Gwen’s death is playing a little too loose with the “untold tales” premise for my tastes. Kurt Busiek came close to this line with the death of Sally/Bluebird in the Untold comic, but this seems like far too gruesome an event to have stayed buried in the past during all of these years. At least Byers doesn’t have Spider-Man save the final blonde on the Brooklyn Bridge, though. The Plot: Spider-Man discovers that Fancy Dan’s son, teenage piano virtuoso Rudolph Loyola, has been kidnapped. While investigating, he discovers that Rudolph’s stepfather is suspected mobster Joseph Loyola, who’s feuding with rival Martin Severino. The Kingpin feeds information to both Spider-Man and Dan, which leads them into a confrontation with Severino and the Enforcers (who didn’t know Rudolph was their former partner’s son). After Severino is arrested and Rudolph is rescued, Dan realizes his son doesn’t recognize him. Loyola retires from crime and moves his family to Florida, while Dan contemplates an Enforcers reunion. Web of Continuity: This story takes place right after Amazing Spider-Man#146. Although ASM #146 was published back in 1975, numerous references in this story place it more comfortably in the mid-‘80s. Not only does a bar owner call Damage Control after Fancy Dan wrecks the place, but there are several allusions to Daredevil having a similar interrogation technique; that’s really the Frank Miller Daredevil, which didn’t exist yet. Also, considering that Kingpin had been in retirement for a while before Miller revived him in the early ‘80s in Daredevil, his role in this story might be hard to fit into continuity. Review: There’s a decent idea behind this story -- humanize joke character Fancy Dan and team him up with Spider-Man in a mob adventure -- and for the most part it works. I do think that a thirty-one page prose story focusing on Fancy Dan is going to pushing the audience’s patience under the best of circumstances, though. The best moments of the story happen towards the end, as Fancy Dan realizes that his estranged son doesn’t even recognize him, and Spider-Man calls out Kingpin for manipulating all of these events, but is forced to acknowledge that Kingpin’s selfish desires actually created the best possible outcome. Grobe and Roman also manage to work a flawless series of “illusion of change” into the story, as Fancy Dan is so disheartened by the loss of his son that he abandons any plans he had for reforming and just goes back to plotting Enforcer schemes. The reader has to feel for Fancy Dan, but by the end of the story, he’s still in the position he needs to be to serve as a throwaway villain. The Plot: Aunt May reflects on the past as both she and Peter prepare to move out of their home. While riding in a moving truck into the city, May and the mover Joe are witness to a battle between Spider-Man and Mysterio. Joe risks his life to help Spider-Man defeat the villain. When she questions why he helped, Joe helps May understand the importance of moving on and trusting Peter to become his own person. Review: Following the previous story, this one is an awkward fit. Aunt May must face the fact that Peter’s growing up, and accept his job as a crime photographer. Just a few pages earlier, Aunt May faced the fact that Peter’s growing up, and accepted his job as a crime photographer, and she did it all on her own without the help of a professional mover. Since May is apparently moving next door to stay with Anna Watson, there’s no compelling reason for her to be going into the city anyway; that’s where Peter is moving. Are we supposed to believe that Aunt May is going to be any help moving furniture? Judged on its own merits, this is an unobjectionable story about letting go of the past and accepting change, but someone should’ve realized that it doesn’t co-exist with “The Doctor’s Dilemma” very well. The Plot: Peter Parker finds himself telling a series of lies to Aunt May, MJ, Gwen, and his professors. He tries to justify his lying as a necessary part of his role as Spider-Man, but finds himself lying to cover unrelated activities. While grocery shopping with Aunt May, Peter is forced to lie again in order to don his disguise and stop an armed robber. Later, while on a date, he spots Vulture and his gang robbing a bank. When the Vulture drops him from a great height, he flashes back to the first lie he caught his parents telling him. A passing sailboat rescues Spider-Man, who loses track of Vulture. The Subplots: Peter double-books dates with MJ and Gwen. He covers his absences during the dates by telling more lies. · The story is set shortly after Amazing Spider-Man annual #5, the issue that revealed Richard and Mary Parker’s double-life as spies. · Peter’s age is specifically given as six-years-old when his parents die, which coincides with most of the comic stories, although I believe some writers have claimed that Peter was as young as two when he came to live with Ben and May. · The Vulture has a gang that consists of three other men who are wearing versions of his costume. Presumably, there’s no connection with this group and the Vultrions from the ‘80s. It’s hard for me to read a story by Nocenti and not just geek out when she hits the mark so perfectly. Everyone knows that Peter has a guilt complex. Everyone knows that he has to lie in order to maintain his identity as Spider-Man. But how many people connected these concepts and actually made you feel for Peter’s predicament? What is it like for someone with such a highly developed moral code to live half of his life as a lie? Nocenti touched on this idea briefly in a Web of Spider-Man back-up, but now she takes advantage of the prose format to fully explore the concept. Aside from creating a pretty heartbreaking characterization of Peter, she also writes a fantastic rendition of Mary Jane -- the boy-crazy girl who’s a little too accepting of Peter’s lies and occasionally knows just the right thing to say to assuage his guilt. Tying his pattern of lying to his parents’ career as double-agents is another brilliant move (as is setting the story right after he discovers their past, instead of generically during his college days). Was Peter destined to be a liar? How can he avoid this question after learning the truth about his parents? Intriguing questions, and Nocenti’s frank exploration of the answers becomes a fascinating character study. 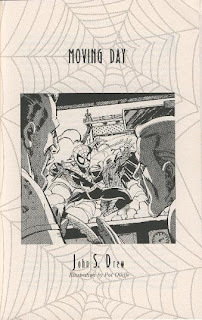 If I have any quibbles at all, it would be the scheduling of this story right after “Moving Day,” since that story also had Aunt May face-to-face with Spider-Man through a forced set of coincidences. The Plot: After Jonah Jameson casually informs Norman Osborn of the newspaper practice of deep background, Osborn dons his Green Goblin identity and attacks a newspaper’s office. The staff is reluctant to give up its unpublished information on Spider-Man, but only one staff member, a young photographer, is willing to stand up to the Goblin. When Spider-Man eventually makes his appearance, the Goblin realizes he’s exhausted his weaponry and escapes. Web of Continuity: This story takes place a few weeks prior to Amazing Spider-Man #39.
Review: Perhaps the most memorable installment in the book, Michael Jan Friedman toys with the reader’s expectations and manages to pull off a twist ending that still plays fair with the audience. I don’t want to spoil the ending (although it shouldn’t be too hard to figure out if you read between the lines), so I’ll just say that this is a clever story that’s executed masterfully. It’s also a story that could only be told in the prose format, so Friedman deserves even more credit for taking a format that isn’t exactly suited for the superhero genre and using it to his advantage. The Plot: Dr. Bromwell expresses his concerns to Peter over his job for the Daily Bugle. He offers him a job as a lab assistant, hoping that he can support Aunt May in a safer environment. Meanwhile, a destitute victim of radioactive steroid testing named Walter Cobb becomes the supervillain Impact. Peter is forced to abandon his job and stop Impact during one of his rampages. Spider-Man seeks a peaceful resolution, but Impact’s heart gives out. Later, Aunt May gives her blessings to Peter to work for the Daily Bugle. He apologizes to Dr. Bromwell and leaves the job. Web of Continuity: This story is set shortly after Amazing Spider-Man #42.
Review: This is more reminiscent of an Untold Tales issue than any other story in the novel. A new villain from the past is introduced (one with sympathetic motives and a simple, old school origin), as the story focuses on a minor supporting cast member who’s never been fleshed out before. And Fingeroth does a fine job transforming Dr. Bromwell into a likeable, believable character. His characterizations of Aunt May and Peter are also faultless, as he addresses a conflict that was often skipped over in the early issues. If Aunt May is so overprotective, why does she accept Peter’s job chasing Spider-Man for the Bugle? Aunt May’s made it clear that she doesn’t like what he does, but she doesn’t tend to bother him about it. 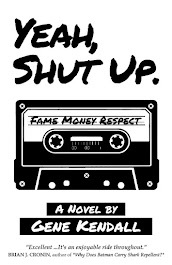 She theorizes in the story that she knows she needs the money, which might’ve influenced her silence. May berates herself for not doing enough to stop Peter after she overhears Dr. Bromwell giving him a lecture on the topic, but later in the story reconciles his job with Uncle Ben’s belief that Peter should be free to make his own decisions. If he thinks he’s doing the right thing, she can’t stand in Peter’s way. The story isn’t entirely clear, but Fingeroth might even be hinting that Aunt May knows that Peter is Spider-Man by this point (remember, this predates the “genetically altered” actress, so the continuity at the time had Aunt May knowing "for years" that Peter was Spider-Man) and is giving him her blessings to keep going if it’s something he feels compelled to do. Peter’s guilt over potentially leaving Aunt May alone or causing her undue worry, and Dr. Bromwell’s anger at Peter for his apparent selfishness, are also well executed. The Plot: Peter Parker is assigned to take photos of the Human Torch’s date with actress Heather Fox. Sandman is also on a date in the restaurant with Candace, a jewelry store clerk he has a crush on. When Candace expresses her attraction to the Human Torch, Sandman snaps into a rage and attacks the hero. Spider-Man and Torch battle Sandman until he is scared away by the Fantastic Four. Heather, bored by the Torch, approaches Spider-Man after the fight and asks if he knows Sandman’s phone number. 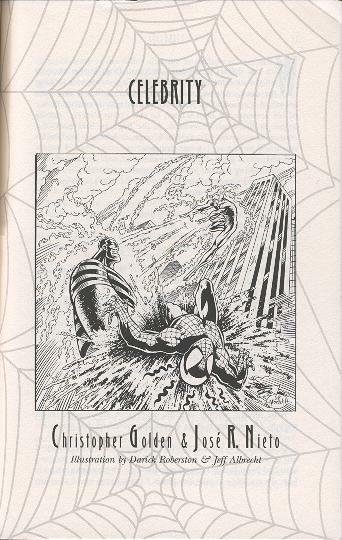 Web of Continuity: This story takes place shortly before Amazing Spider-Man annual #1. Sandman is also referred to by the narrator as William Baker throughout the story, further complicating the later retcon that claimed his true name really is Flint Marko. Review: This is yet another Silver Age-era Spider-Man/Human Torch team-up. I can’t say it really adds anything to the genre. Selecting Sandman as the villain does work to the story’s advantage, though, since at this point the audience knows he’s destined to reform (and doesn’t know yet about John Byrne’s ridiculous retcon), but also knows how nasty he was during this era. 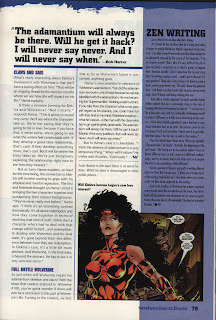 Golden and Nieto reconcile the two portrayals by presenting Sandman as a hard luck loser with a bad temper. He wants to do right, but once his ego is bruised, he irrationally acts out and turns on the society he feels has rejected him. This gives Sandman a more nuanced portrayal than he received in the Silver Age, but also avoids any direct contradictions. I also enjoyed the twist that Heather and Candace are on dates with the wrong guys; it’s probably the best moment of the story. But as a Spider-Man/Human Torch story…they’re the dullest elements of the story, which is a problem. The Plot: Out on bail, the Looter immediately begins a new crime spree. Spider-Man follows him to a science exhibit where he hopes to rejuvenate his powers with a recently discovered meteor. When the Looter runs out of helium, Spider-Man recognizes him from hours earlier -- he couldn’t afford two helium cartridges at the Chemco supply store. Spider-Man races to the closed store and ambushes the Looter there. The Subplots: Peter is buying supplies for his webbing at Chemco but doesn’t have enough cash. He gets an advance from Jonah Jameson, but can’t make it to the store before it closes. On his way there, he accidentally offends Gwen Stacy. Later, he’s invited to lunch with another classmate, Sally Green. He annoys her by leaving early when he sees a report on the Looter’s crime spree. Web of Continuity: This story is set a few days after Amazing Spider-Man #36.
Review: The major flaw in this story is the assumption that page after page of the Looter rigging up his devices and causing chaos is inherently entertaining. The Looter’s gimmicks are a visual gag, and with no one to bounce off of for much of the story (and very little internal narration), his trademark nuttiness isn’t exploited very well, either. Garcia and Askegren do have a decent handle on Spider-Man and his supporting cast, though, and his run of misfortune throughout the story doesn’t feel tired or hackneyed, which is often the case when writers feel as if they have to go out of their way to insert problems for the hero. The hook of the story is that Spider-Man’s forced to go without his webbing for the entire adventure, as opposed to the standard last-panel cliffhanger. His solution for moving across town is to hitch a ride on a television news helicopter, which has of course abandoned him by the end of the story. Without the webbing, he also needs something to keep his automatic camera in place. The best solution he can come up with is a roll of duct tape. The deceivingly simple journey of purchasing the chemicals he needs for the webbing is also a series of archetypal bad luck moments that allow the writers to use the supporting cast in a way we haven’t seen in the novel so far. This feels the most like a Spider-Man comic so far, assuming someone would’ve commissioned an extra-length Looter issue.